Here's what you do Monday, August 13, 2012. "Separately, Meryl Streep and Tommy Lee Jones are national treasures, but together they are simultaneously spectacular and intimately awe-inspiring. I have never loved either one more." In a summer of super heroes, it's good to see some regular heroes. Grab a date. Make it a date afternoon. We're recommending the movie for the afternoon around 4, so that you can make it to Leon's in Decatur in the evening for wine and beer flights, and a good game of bocce. Meryl Streep and Tommy Lee Jones play a couple trying to get back their mojo. Enter Steve Carrell as Therapist to help them out. First: Ease into Monday with a simple breakfast at Panera Bread. Their egg and cheese on ciabatta is so, so good. Have that with a hot cup of tea with milk and sugar and you're good to go. Ever wonder what the whole english tea tradition is all about? With the London Olympics winding down, it might be good to extract a little of that tradition from good old Britain while we have the chance. Check out this video that gives you the full details on making tea from the most pleasant of hosts. Now, you might not be able to recreate the process at Panera - paper cups and all - but you can get close. ($15). Second: Continue your reading. Last week, you started Hemingway's The Sun Also Rises. Finish that up today in the Monday morning sun with your cup of tea. Third: How about some Indian? Planet Bombay is tucked into Moreland Avenue in Little 5 Points. They bring all the flavors you're hoping for. Garlic Naan. Dahl. The tandoori chicken is great. Try the Ox-tail lunch, or the goat if you're feeling adventurous. It's all good baby. ($10 per person). Lunch at Planet Bombay. Spice up lunch time. Fourth: Nap. Take an early afternoon nap. You deserve it. Follow the perfect bed rules. Get your date a flower at Candler Park Flowers to get into the mood. Sixth: Hope Springs. It's playing at Phipps at 3:05 and 4:30. Take your pick. ($10 per person). Finally: After Hope, head over to Leon's Full Service in Decatur and play some Bocce. On Monday nights, they have Flight Night. Myriad beer and wine flights (five or six of each), with food pairings. The choices vary, so go in with an open mind and an adventurous spirit. When you're done, try out a game of Bocce in Leon's back yard. ($30 per person). 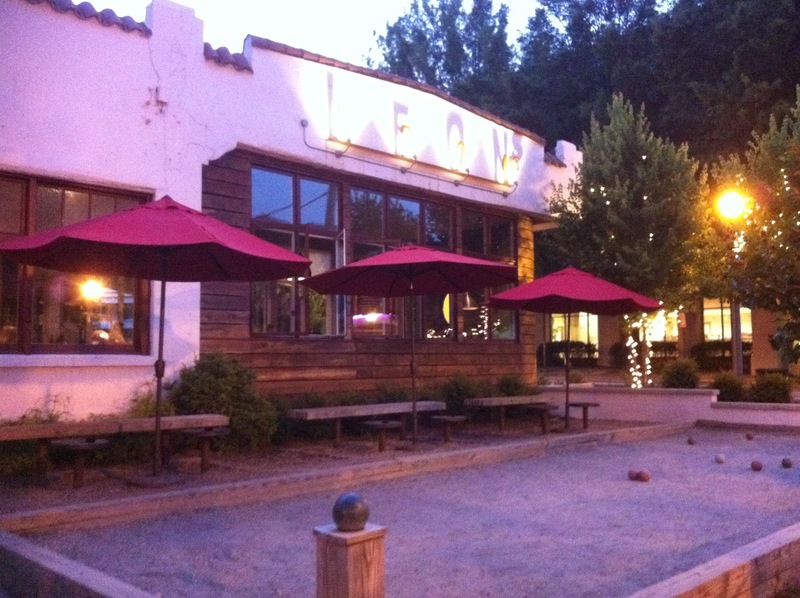 Have a Monday Night wine flight and a game of bocce at Leon's in Decatur.